These are used diced for soups or to add flavour to stews. All cuts are suitable. but the lean pieces (forehock, gammon, collar) are sometimes casseroled or stewed whole, tied with string. 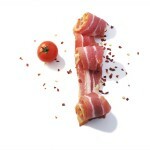 All cuts are suitable but rashers are usually cut from the back. streaky or collar. Steaks are cut from the gammon or prime back. Large lean pieces are generally used – whole gammon or ham, whole gammon hock, large piece of back, whole boned and rolled forehock or either of the collars. These cuts are usually boiled first before baking. Bacon, Ham, Gammon – what’s the difference? 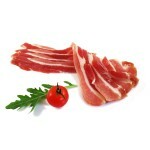 All are cured meats, which means they are prepared using salt or brine and all can be smoked. So what’s the difference? 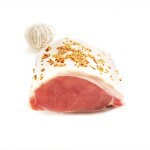 Gammon comes from an old French word, Gambe, which means the hind leg. Originally Gammon was the term used when the meat from the hind leg was cut into joints after the whole carcass has been brined or smoked, while Ham referred to meat which had been cut first and brined or smoked afterwards. 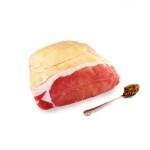 Nowadays the term Gammon is only used for meat cut from the hind leg, regardless of how it was prepared. While a ham can be cut from the hind leg it can also be from other parts of the carcass, so it’s just a slightly less specific term. Bacon is meat cut from parts of the pig other than the legs, such as the loin, collar or the belly. What’s the difference between dry curing and wet curing? In a word – flavour! Wet-cured bacon is prepared by immersing sides of bacon in brine or by injecting brine into the meat. It’s popular with manufacturers as it’s a faster and cheaper way to cure, but it has downsides for flavour. The final product is allowed to have up to 10% brine by weight, leading to shrinking on the pan. When you see a white liquid come from your rashers, that’s the brine and is a sign they have been wet cured. By contrast, dry-cured bacon is rubbed with a mixture of salt and sugar in various proportions and they are given time to cure the meat. It’s a slower and more labour intensive process but it results in a drier finish and fuller, more pronounced flavour. This is the way meat was cured prior to it becoming an industrial process. You’ll benefit not just from a much better taste, but because there will be less shrinkage during cooking and it is easier to get a nice crisp result. After curing, bacon is ready to eat, and is known as green bacon. It may also be smoked at this point point, in which case it will be, well, smoked bacon. So the cuts and the initial preparation of green and smoked bacon is exactly the same, it’s only the last step that makes the difference.